The Mayor of Casterbridge isn't necessarily a book that I would have picked up of my own volition, had it not been for my dad. My dad isn't usually the type to really gush about the things that he reads, but from a fairly early age I've known that he really likes Thomas Hardy. As such, I figured that I'd try out one of his books, see if it's rubbed off on me. 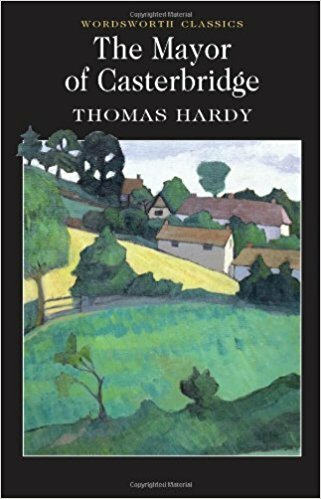 The Mayor of Casterbridge starts when main character Michael Henchard sells his wife and baby girl in a drunken fit of pique, an action that he regrets immediately upon waking the next day. It then skips ahead nearly twenty years, when his wife and grown up daughter track him down to the agricultural town of Casterbridge. There they find that he has become a rich and well-respected member of the community. He invites them to come and live with him, to make up for his poor decision, but it soon becomes apparent that the consequences of that day are still making themselves known. I found this a bit of an odd book to read, as on the one hand the prose can be a bit dense and slow-going at times, but it is then combined with a plot in which a lot of active events happen within a comparatively short space of time. So there is a part of me that wants to describe this as a slow-burner, but then I know that with the amount that actually happens it doesn't feel like an accurate description. In regards to the actual plot, a lot of it is the kind of Victorian social drama that I quite like, although the main character's headstrong personality does see it get very dramatic and scandalous quickly and surprisingly often. The main draw for The Mayor of Casterbridge is the characters. The main ones that contribute to the plot are Henchard, his daughter Elizabeth, his would-be protegee Farfrae and a mysterious woman from Henchard's past Lucetta. Mostly it's the first and last characters whose actions most impact the plot. Keeping with my regular rule of avoiding spoilers, I shan't be expanding much on Lucetta. But even without her, there would probably be an impressive amount of plot stemming purely from Henchard as a character. He is pretty perfect as a main character in a tragedy, as he is an intensely passionate person and is more or less incapable of moderating his emotions and impulses. With someone that volatile, it's almost inevitable that something unfortunate will happen. Farfrae and Elizabeth are comparatively passive, but they nicely balance out two very outgoing characters with emotional moderation.